Giant animal flicks have had a resurgence of late, thanks to the adventurous executives over at SyFy. Every week seems to see the introduction of a new Asylum or Roger Corman b-movie with gruel-thin plots and awful CGI. These movies fill a niche, sure, but while some viewers find these movies’ intentional cheapness a main draw, endearing even, most are such amateurish productions that they are unwatchable. That’s a shame. Flicks such as Dinoshark or Mega Python vs. Gatoroid share a pedigree with Them! and The Beginning of the End, but while Bert I. Gordon could never be accused of being a great filmmaker, his silly movies are still watchable 60 years later. These newest monster flicks are just putrid, marring what can be a very dynamic subgenre of sci-fi/horror. Today’s film, Lake Placid, is a case in point that these films can be dynamic. 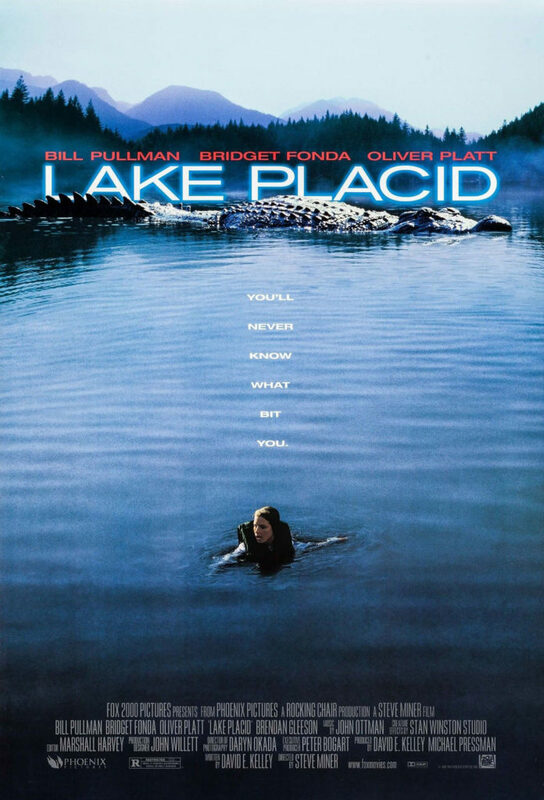 Released in 1999, Lake Placid takes place at a fictional lake in Aroostook County, Maine. In real life, Aroostook is about as far off the beaten path as you can get in the United States without going to Alaska. It makes for a pretty good setting for a monster flick. So, what is the monster threatening the poor folk of Maine? It’s a giant crocodile, measuring some 30 feet long. In the opening scene, it claims the life of a state fish and game officer, and that’s enough of an excuse for a team led by fellow Fish and Game Officer Jack Wells (Bill Pullman) to show up on site to investigate, and possibly kill, the crocodile. Wells is joined by a clichéd cast of characters, including the gruff local sheriff, Hank Keough (Brendan Gleeson, whose accent is totally unidentifiable in this film); a stuck-up scientist from New York City, Kelly Scott (Bridget Fonda); and a spoiled rich eccentric, Hector Cyr (Oliver Platt). Despite how many boxes on the film tropes list these characters tick, they all work together quite well. Cliché is only a bad thing when used poorly. If handled deftly, especially in a tongue-in-cheek manor, such as in Lake Placid, clichéd characterizations do much to make sure the audience doesn’t rebel against the absurdity of a film. This flick is about a giant crocodile, in Maine, that eats people and moose in gigantic gulps. The idea of a crocodile being able to survive in the cold waters of Maine is silly enough, but that this movie is basically a Jaws ripoff means that any serious weight would throw off the mood of the film. It has to embrace the absurd. It has to be a bit of a spectacle, otherwise it’s just a bad joke. But never fear. As monster flicks go, Lake Placid is very good. The crocodile is a menace not overused, helping to sustain some tension in a film that is actually quite lighthearted considering the subject matter. The CGI is not the best. Even though it hails from the early days of the technology, it could have been better. The CGI is not a disaster, as in something like Anaconda, but there are a couple shots here and there that yank a viewer right out of their suspension of disbelief. Director Steve Miner and his team set out to make a monster flick. Personal dramas and other such filler are kept simple and rote because Miner knew what was really important. The crocodile is a satisfying villain. Many of its kills are unexpected and delightfully gory. So many of those awful monster flicks on SyFy could take a lesson or two from Lake Placid. It follows a formula as well-worn as any seen in film history. It breaks no new ground, and that doesn’t matter. It’s just a good movie.